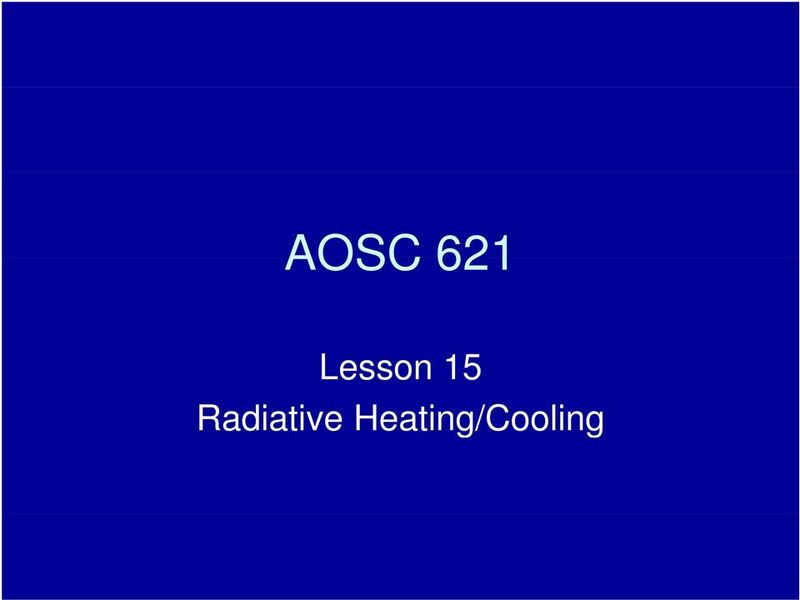 Download "AOSC 621 Lesson 15 Radiative Heating/Cooling"
11 Heating rates in the Atmosphere Let s now examine the contribution that each term makes to the heating and cooling of the atmosphere. 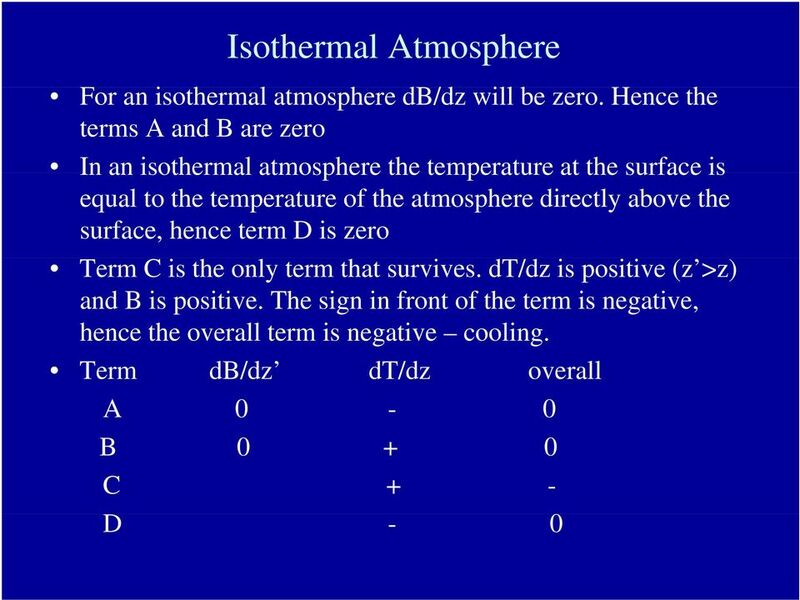 But first we must examine the sign of This term can be defined as follows: the term dt T (, T (. 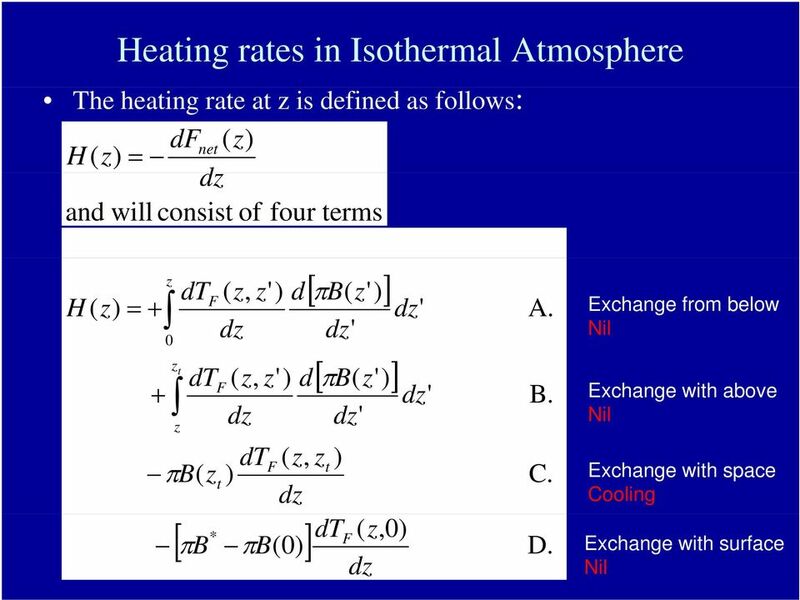 limit it as d for any ' greater than, T (, T (, dt d dt and will be positive because the distance from d ( ) to ' is less than from to '. 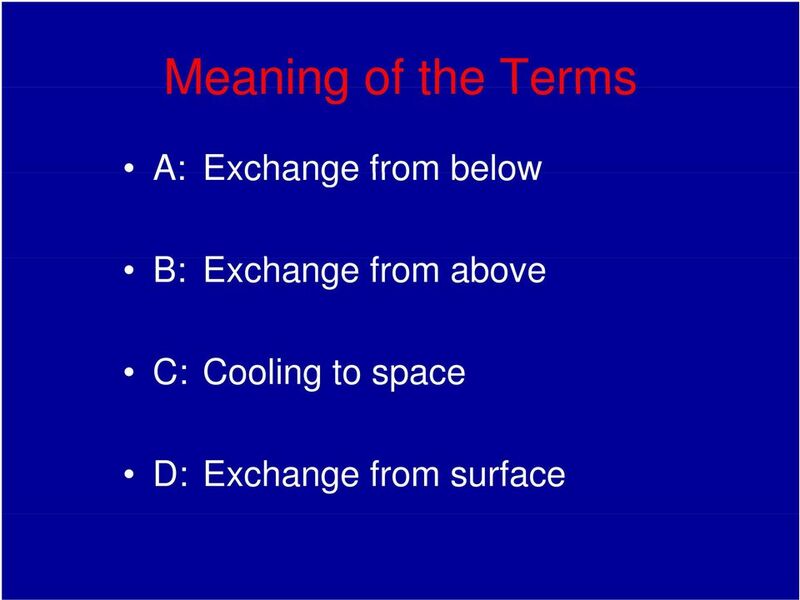 Hence T is greater. 17 Temperature inversion Assume that is at the inversion. 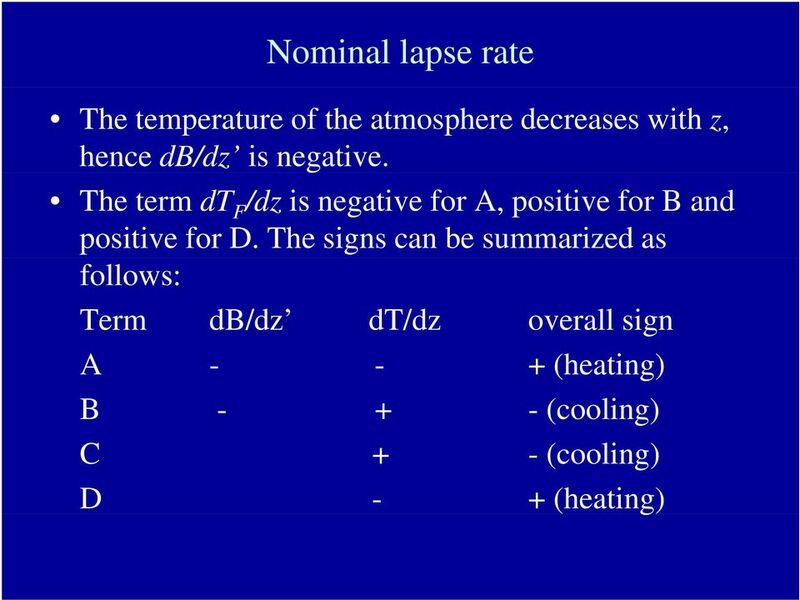 db/d changes sign at : Term db/d dt/d Overall sign A (cooling) B (heating) C + - (cooling) D - + (warming) Note that term A shows cooling, whereas for a nominal lapse rate it gave heating. 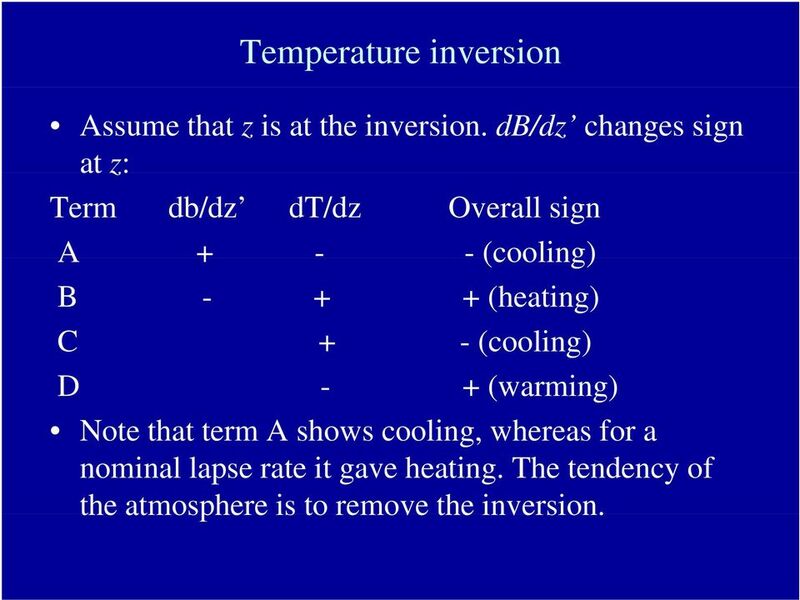 The tendency of the atmosphere is to remove the inversion. 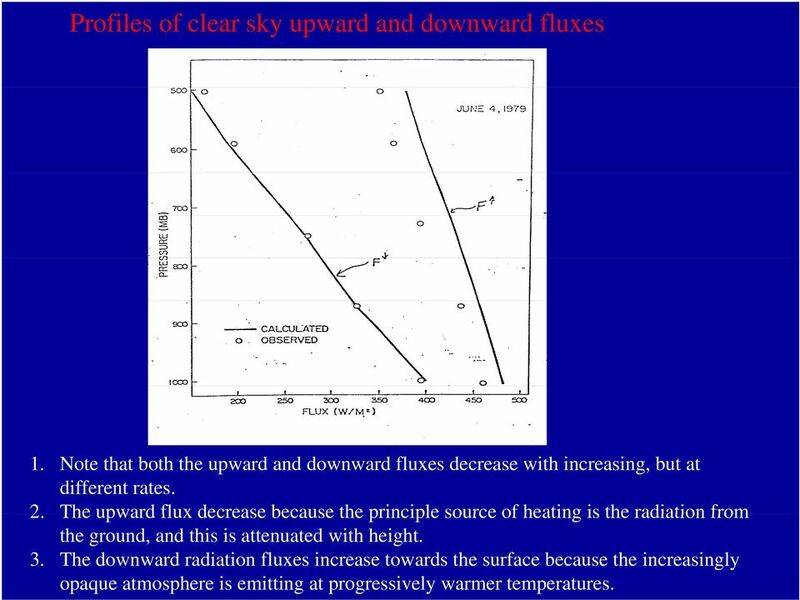 19 Profiles of clear sky upward and downward fluxes 1. 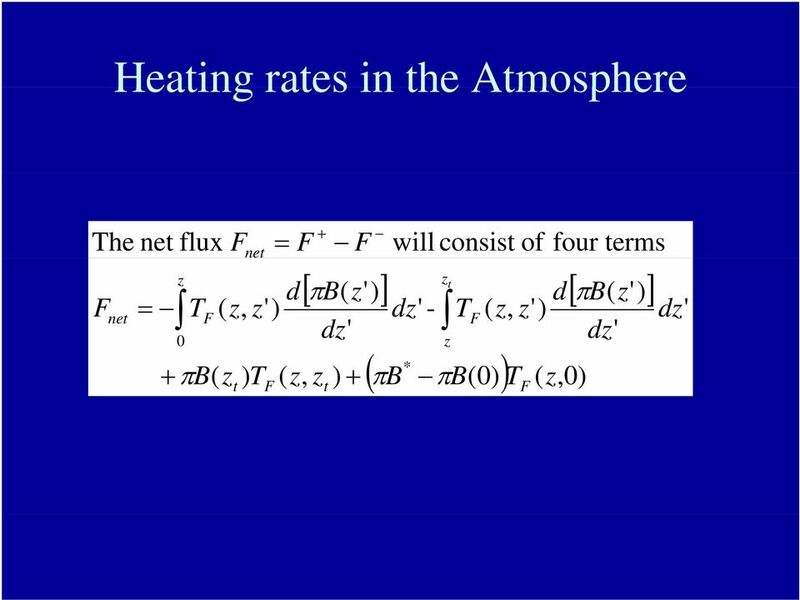 Note that both the upward and downward fluxes decrease with increasing, but at different rates. 2. 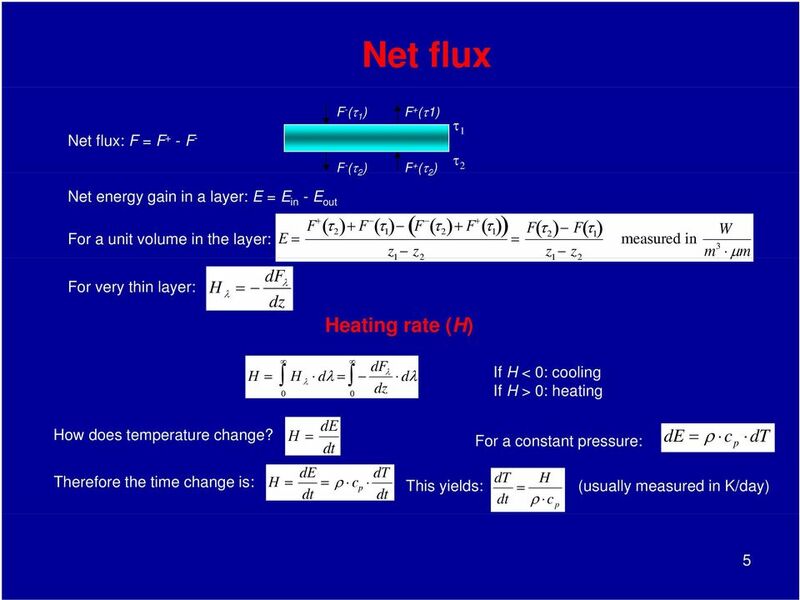 The upward flux decrease because the principle source of heating is the radiation from the ground, and this is attenuated with height. 3. 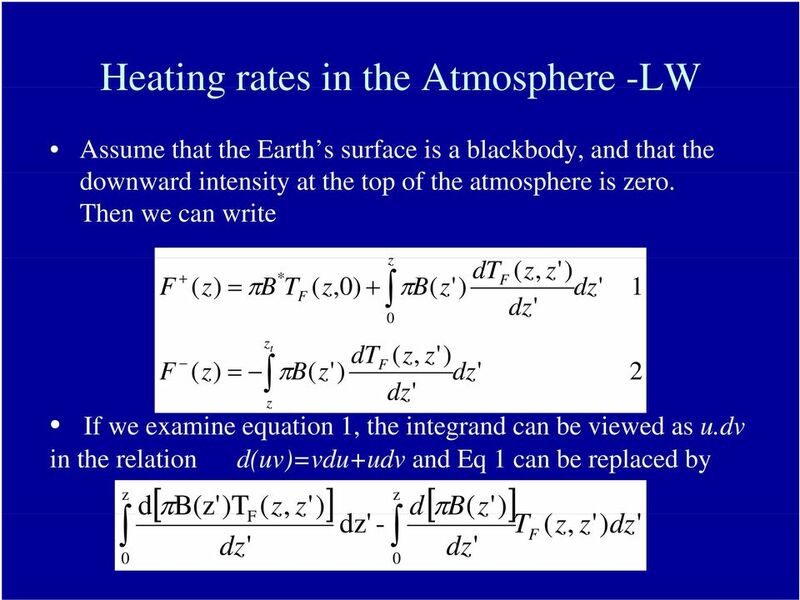 The downward radiation fluxes increase towards the surface because the increasingly opaque atmosphere is emitting at progressively warmer temperatures. Stability and Cloud Development. 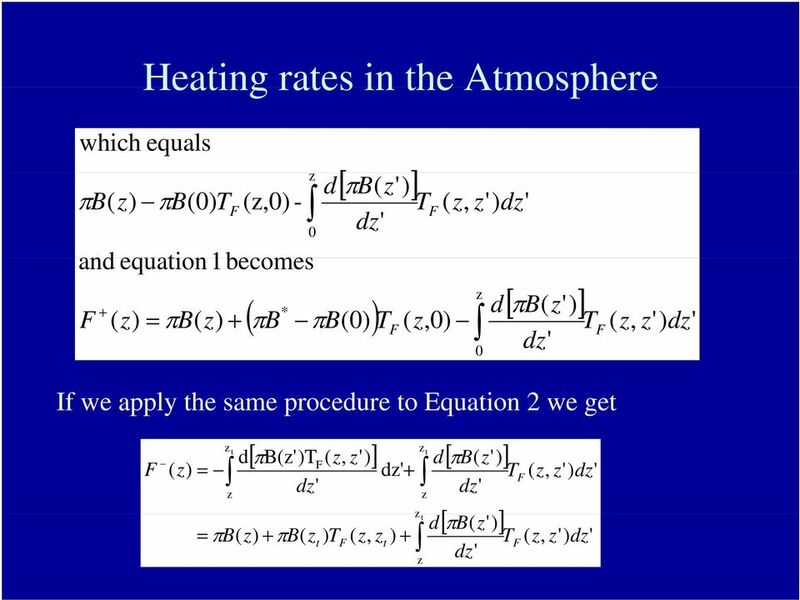 Stability in the atmosphere AT350. Why did this cloud form, whereas the sky was clear 4 hours ago? 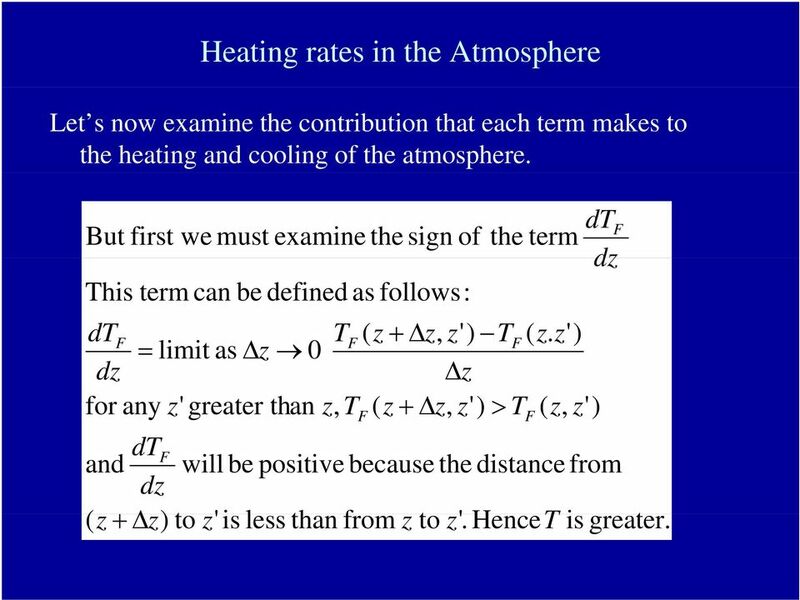 13 CHAPTER TWO SOME CONCEPTS IN CLIMATOLOGY 2.1 The Adiabatic Process An important principle to remember is that, in the troposphere, the first layer of the atmosphere, temperature decreases with altitude. 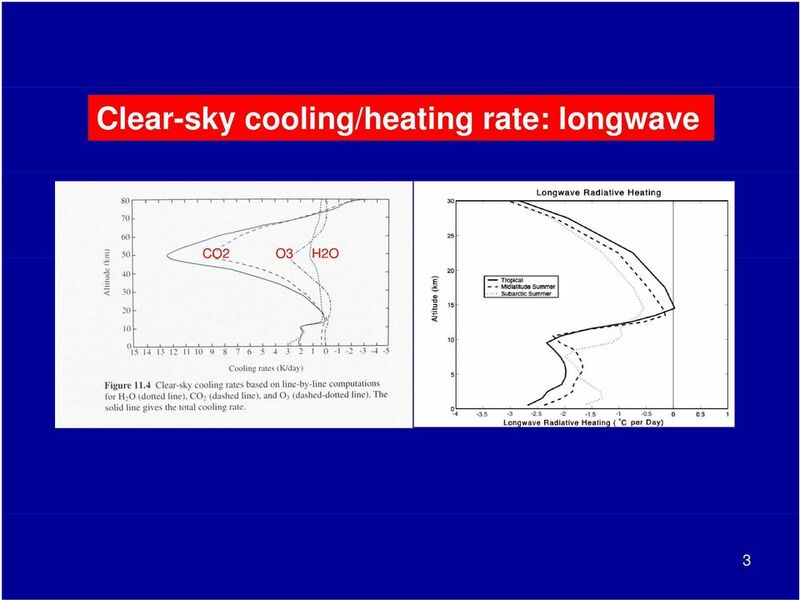 Chapter 6: Cloud Development and Forms (from The Blue Planet ) Why Clouds Form Static Stability Cloud Types Why Clouds Form? Clouds form when air rises and becomes saturated in response to adiabatic cooling. 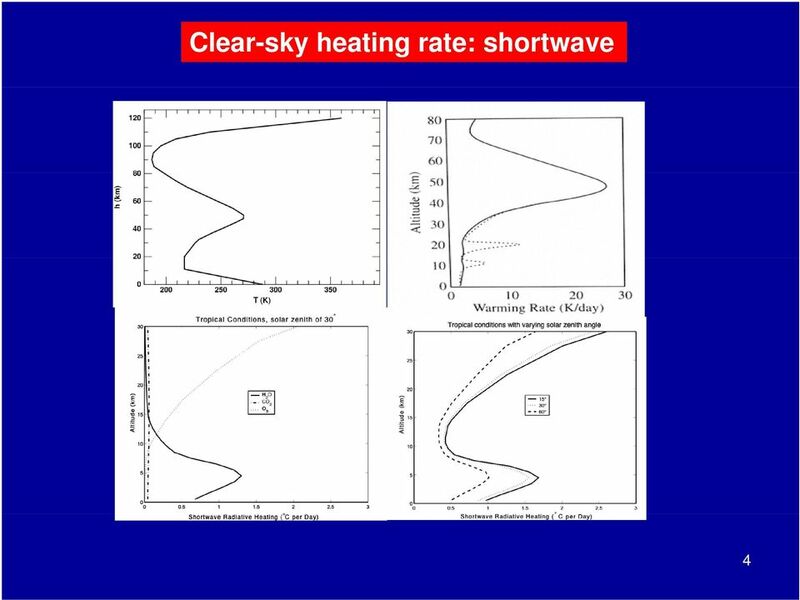 Classes of typical cloud types. 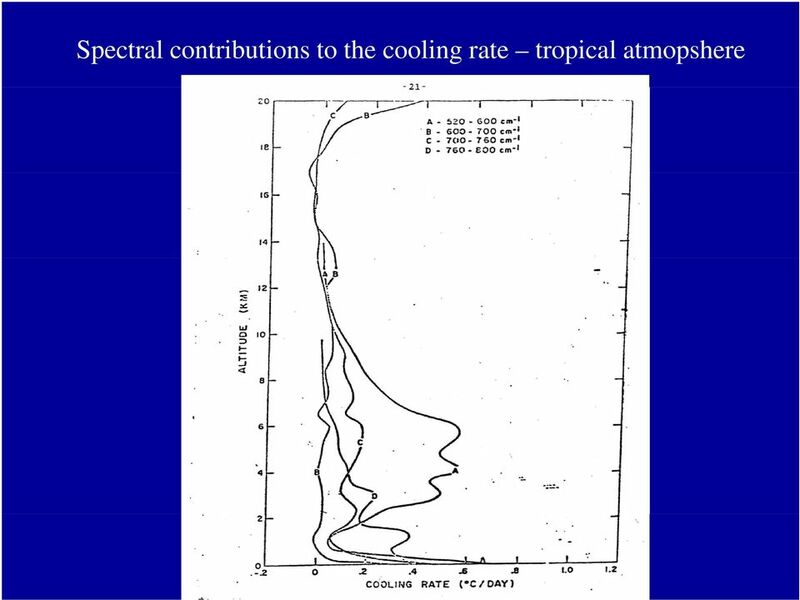 Name: Date: LAB: Dew Point and Cloud Formation Adapted from Exploration in Earth Science, The Physical Setting, United Publishing Company, Inc.
Prentice Hall EARTH SCIENCE Tarbuck Lutgens Chapter 18 Moisture, Clouds, and Precipitation 18.1 Water in the Atmosphere Water s Changes of State Precipitation is any form of water that falls from a cloud. 11.3 CLOUDS AND PRECIPITATION. 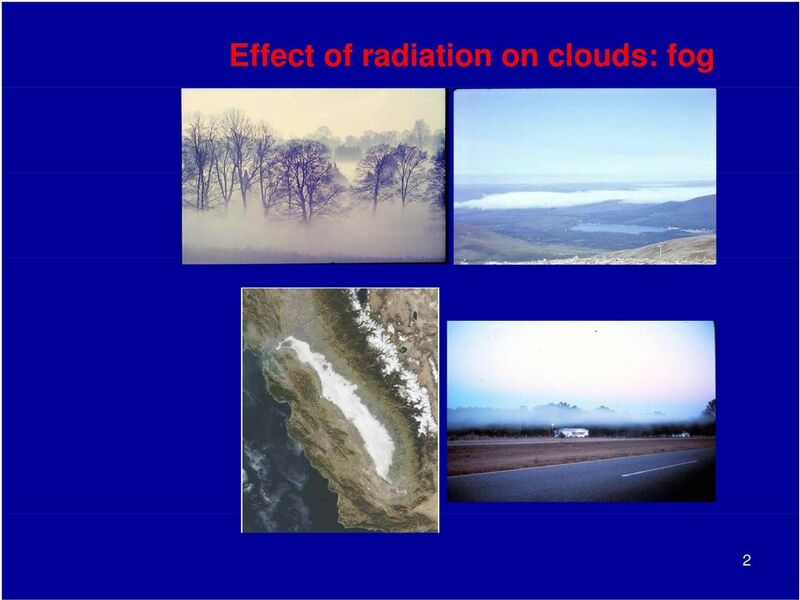 Main Idea- Clouds very in shape, size height of formation and type of precipitation. 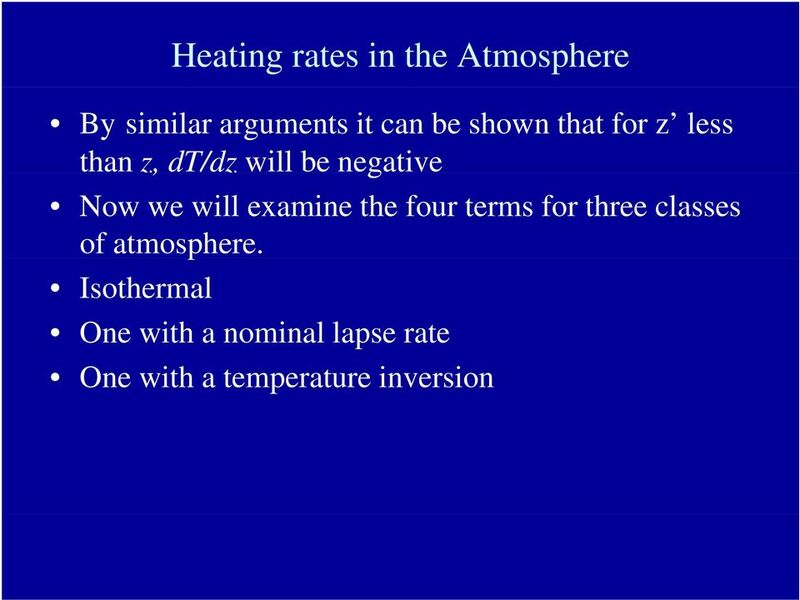 2) What atmospheric layer is the home of weather, has the greatest density of gas molecules, and has a decrease in temperature with height? February 17 th Video Conference Agenda 8:30 am Video, audio and connection checks 9:00 am Brief intro by mediator, Ellen Holmes, followed by 3 to 5 minute Day in the Life of Presentations from each school.